The border crossing was easy and Song and I completed the procedure about an hour before the closing ceremony. We both wanted to stay for it. There is a PDTC Hotel at the border and little else. The hotel allowed us to store our luggage in a store room and sit in the air conditioning until it was time to see the ceremony. We were given VIP seats. OK just an area with a few steps but it was right in front where all the action takes place. The other foreigners joined us there. Some Pakistani VIPs were actually given plastic chairs next to us but most Pakistanis were up in the bleaches. The ceremony is choreographed with both sides performing the same actions at the same time. The Pakistani soldiers are chosen for their height (minimum 6ft 2 inches) so they are taller than their Indian counterparts. Soldiers on both sides are chosen for their ability to lift their legs high, preferably to be able to touch the fan they wear on their heads. Most of them could actually do this, quite amazing, especially as it is done while marching! They all put a lot of energy into their performance. The audiences on both sides are encouraged to shout Pakistan / Jinnah or India by the supporting cast of non military personnel. After several of the soldiers have shown off their skill the flags are unhooked and slowly lowered across each other. One Indian and one Pakistani shake hands, the gates are closed for the last time and the ceremony ends. I am glad I have seen it. I understand that if you are on the Indian side you do not get to see very much at all as foreigners do not get space right up front. Then it was a matter of getting the bus into Lahore and an auto rickshaw to the Regale Internet Inn where I stayed last time. This time I wanted to see the old city before heading for Islamabad. I went with a young Englishman, Joe. We headed in the right direction and became lost, always great to do in an old quarter of town. This allowed us to see the de-hairing of goats heads and legs. The heads and legs are collected in one area. They are then put into the flames from a fire to singe the hair. Then another group scrape the hair off and a final group wash it. The heads and legs are then sold along with lungs and stomachs. The fort is quite large and there doesn't seem to be an entrance fee. Joe and I went in a back way but we came out the front way and I didn't see a ticket office. Maybe we were lucky. Traditionally the location of Lahore and its fort were attributed to Lo the son of Rama, hero of the Ramayana Hindu epic (1200-800 BCE). Archaeological evidence shows that people lived here before 1,000 CE. The fort has been destroyed (by the Mongols amongst others) and rebuilt many times over the years. Akbar rebuilt it of solid brick masonry in 1566 and it has been modified and added to since then. Jahngir's quadrangle contains the Diwan-e-Khas (Hall of special audience) built for Shah Jahan in 1645. In fact the pictures I have chosen all represent something built for Shah Jahan, he of Taj Mahal fame. The Badshahi Mosque is just outside the Alamgiri Gate of the fort. It was built of red sandstone for Emperor Aurangzeb. It took 2.5 years to build and was completed in 1674 CE. Joe was in long shorts and not allowed in. There are several square areas where if a person whispers into one corner a person in the opposite corner can hear them. The painting of the mosque walls are beautiful. There are supposed to be relics of Mohammed, his daughter and son-in-law in the chambers above the gate. The courtyard is said to be the largest mosque courtyard in the world for outdoor prayers (161.5 x 160.6 meters). After a snooze back at the hotel I went to find a bank and some money and came across a demonstration about rising food prices. I had already realised that food was more expensive than in December so I am not surprised people are demonstrating. While watching the scene 2 young men, Michael and Asif, started talking to me and eventually we went for a cup of tea together. They are Christians and feel marginalised in a Muslim society. They also find that other Christians practice nepotism when employing staff. It was an interesting conversation. They invited me for dinner at Michael's family home. When I arrived there was electricity, then it went off. We had to wait for the electricity to come on to eat, although they did have torches providing some light. Electricity supply certainly hasn't improved since December! The family could speak very little English but were very friendly. They live in the old quarter with his parents on the ground floor, one sister with her husband on the next floor and the next floor occupied by his brother and sister-in-law. Each landing had a washing up area with tap and drain. Michael and Asif live in rooms elsewhere. Part of the meal was purchased and part home cooked. I liked the home cooked mutton very much. The brains were also good. I have not had brain since I was a young girl. Once again I found the Pakistanis very friendly people. Next morning I headed straight for the Diplomatic Enclave. After being sent to several wrong entrances I finally arrived at the one where the shuttle buses leave from. There were a French couple and an Australian as well as lots of Pakistanis heading to the Chinese Embassy. John, the Australian, is also staying at the Youth Hostel. We were given a form by a guard and told to obtain a letter of Invitation, a confirmed hotel booking and a bus ticket to China. The man handing out the forms could not tell us how to do all this. John and I decided to go through the process together since we were staying at the same place. We went to a travel agent in Aabpara who said he had contacts and he would be able to tell us tomorrow how much it would cost. Next day he had bad news. His contacts in Kashgar were no longer allowed to issue Letters of Invitation. He could not help us. We decided our best bet was to immediately go to the Blue Area and find a Travel Agent there. This one seemed better as he had contacts in Beijing. He would tell us if it was possible next day, Thursday. Thursday he said that his contacts needed 2 working days, call him on Monday afternoon. Then it was Tuesday as Monday was a public holiday in China. On Wednesday the, by now expected, bad news came through. No more invitations were being issued. 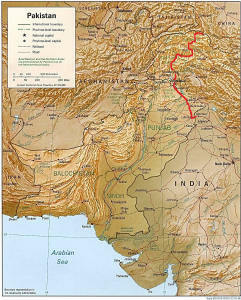 Since my travel plans are to head east my only option is to return to India and go to South East Asia via Bangladesh. Thursday I went to the Indian embassy, obtained the form, walked back to the diplomatic bus stand, had it typed, walked back to the Indian embassy and handed it over. The shuttle bus is 50 rupees per return trip so walking is much better. The next step is to go to Sost to change some of my clothing and check on the van. I could not find any information about NATCO buses so Friday I went Pirwadhai where buses leave for many different places and took my chances. Again this is easy from Aabpara as the 101 bus goes between the two. Unfortunately it is the start of school holidays and the daily bus to Hunza was full. I bought a ticket for the next day but waited until the bus actually left - just in case there someone did not turn up. The bus left at 2:30pm and arrived in Hunza around mid-day the next day. Sitting up overnight is NOT my idea of fun. Then it was a mini-bus to Sost. I was welcomed warmly by Hakkim, the manager of the PTDC Hotel where the van is parked. After a wonderful shower and some green tea I pottered in the van, exchanging clothing, storing souvenirs and seeing what I could find for dinner. It was an early night but I was over tired and took a while to go to sleep. Next day I ran the engine, finalised my repacking and walked through the town looking for something to buy and cook. After all I could not eat all of the food stores and there was very little to start with. It was wonderful to eat European style food for a change, especially the home cooked variety. I had a chat with Hakkim who informed me that he had been told by a good authority that the Chinese had just lifted the restrictions on visa for one month. Suddenly I felt much happier! The return trip was similar to the last one - an overnight bus from Hunza to Pirwadhai. By the time I returned to the Youth Hostel it was about lunch time. However, after a welcome shower I went across to the campground to see if John was still there. He moved out of the hostel because of the cost of the luxury double rooms. (I have a cheap double room). Dorm beds are difficult to get as the hostel is constantly full of groups. He is on his way to Mongolia and had hoped to go through China. He also has a tent and other camping equipment. His tent was there so I left a note. Later he came across to the hostel to hear the news first hand. He did not really want to go back through Afghanistan and was having trouble finding a cheap flight to one of the other 'stans. I had to pick up my Indian visa on Thursday and have a really good sleep in, so he agreed he would try and phone the embassy in the morning and see what he could find out. Friday we would both go to the Chinese embassy. Through mis-communication we missed each other and went separately. Very few embassies are open on Friday so it was quiet. But the reception at the Chinese embassy was totally different, like chalk and cheese. This time I was allowed through the door to speak to someone behind the counter! I asked for the requirements, asked for them in writing and checked that I fully understood them. Same as before except no letter of invitation. YES! YES! YES! We spent the weekend getting the hotel confirmation, the bus tickets to Hunza and various photocopies. Monday morning we were at the Diplomatic Enclave bus stop early, had our applications typed and arrived at the embassy before it opened. This time there was an official checking the papers, not just a guard. Quite a few Pakistanis were turned away as they did not have the correct documentation. Eventually our turn came - and we were let in! Next step the counter. Once again a thorough check of the documentation and our application was accepted!!!! We were both shell shocked, especially as John had received different information from some Germans. In the meantime John and I are sharing dinners. He has a stove and some pots and pans. What a pleasure to have more European style food, even if it is quite basic. There is a limit to how much rice and chicken or bread and curry I can eat. Somehow the food was nicer in India, except of course for the bread and potatoes for breakfast! Picking up the visa presented no problems at all. What a relief! We leave on Sunday for Sost. Tuesday into China. Unfortunately the good seats on the Saturday bus have all been taken so we are sticking to the original tickets. Seats 1 and 2 are good. Once more sitting up on an overnight bus. There was a flat tyre which delayed our arrival in Hunza. The result was that the mini buses to Sost had all left. We took the last one to Passau in the hope of picking up a mini bus from Gilgit. No such luck. The only one that came had enough space for 1 person only and there were 4 of us. One took the seat, then there were 3. We waited and waited. Eventually an air force man with a new Land Cruiser stopped for us. He drove very well, very fast (up to 120kph) and knew the road because he slowed right down for the potholes. One night in Sost and then the bus to Tashkurgan in China. We were told it left at 9:00 am and were there on time, only to be told it left at 10:00 am - not nice after such a long journey and a short night's sleep! It actually left at 11:00am. Oh well this is Pakistan. Customs and immigration for Pakistan was completed in Sost. Since there were no shops before China John and I changed our money at a good rate in Sost. Then we entered the Khunjerab National Park where we had to pay an entrance fee at an extremely bad rate. We were not impressed! The scenery was great though. The road goes through a narrow pass along side the river (not the Indus but a tributary). The water became clearer the closer we came to the top. It had not yet picked up any silt. Further down the highway the Indus river looks rather like mud it picks up so much silt.. The Chinese border is officially at the top of the Khunjerab Pass (4,800m). You can tell where the border is because the road becomes just like a standard western road - tarred verges, lines on the road, no potholes.